MrPictovid has posted two great videos of the club layouts from the 2018-19 Open House season. Ray Schuerger has graciously provided a collection of excellent pictures of the club layout. Please note: All pictures (C) Ray Schuerger and are used here by permission. No permission is granted to download or republish the pictures in any manner. Thank you! In support of the Beaver County History Coalition's Annual Beaver County History Celebration Weekend, Ohio Valley Lines Miniature Railroad Museum Library will be open from 12-5pm Saturday and Sunday May 5 & 6 2018. 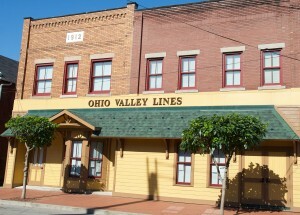 In support of the Ambridge Historic District's Spring Fest, Ohio Valley Lines Miniature Railroad Museum Library will be open from 12-5pm Saturday May 12 2018. See our Facebook event page here for more information. 2018-2019 Holiday Show dates Posted!! The HOLIDAY SHOWS page has been updated with the new dates for the 2018-19 season.